A fresh, innovative, and streamlined approach to the LSAT, featuring techniques geared towards students aiming for top scores. Now with more practice problems and new online resources! The Manhattan Prep Logic Games LSAT Strategy Guide is truly cutting-edge. Containing the best of Manhattan Prep’s proven strategies, this book will teach you how to tackle the LSAT games efficiently and flexibly. Beginning with how to recognize each and every game type, the Logic Games LSAT Strategy Guide takes you through the entire solving process. You will learn strategies for making inferences, techniques for accurate diagramming, and tools for improving your time management. Each chapter is designed to encourage mastery with timed drill sets that use real LSAT logic game questions and provide in-depth explanations, including hand-drawn diagrams and notes from Manhattan Prep’s expert LSAT instructors. The books wraps with coached practice sets and with complete solutions to all the logic games in PrepTests 40-60. Additional resources are included online and can be accessed through the Manhattan Prep website. 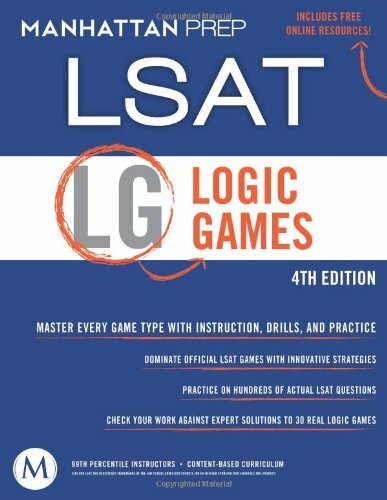 Used by itself or with other Manhattan Prep materials, the Logic Games LSAT Strategy Guide will push you to your top score.